A wonderful bike and walking trail runs for nearly 10 miles along the east coast of Kauai from Lydgate Park north through the town of Kapa'a and past Kealia Beach. Additional phases will eventually extend south to Nawiliwili and north to Anahola. The bike path meanders along spectacular rocky shorelines and golden sand beaches crossing streams and rivers by way of several wide wooden bridges. Rest areas are available at regular intervals along the way. 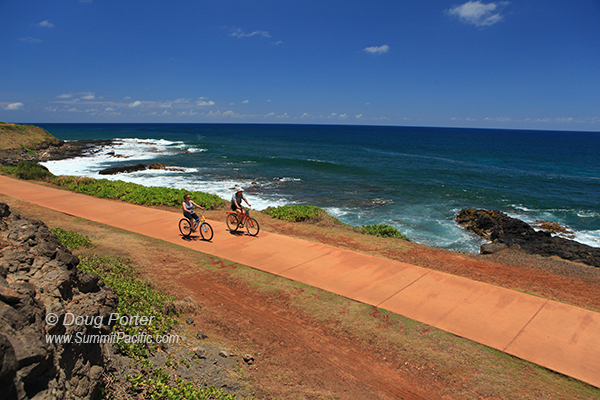 Walking or biking along the path is a great activity for couples and families and runs directly past several vacation rental including Waipouli Beach Resort and Islander on the Beach. Bike rentals are available at several location in Kapaa.